* Participants in the optional Exploration Seminar to be run by ExxonMobil will travel to Oberlin a day earlier on the 20th. Travel to Union College on 21st April (unless attending the ExxonMobil Exploration Seminar would be optional. Optional ExxonMobil Exploration Seminar all day on 21st. Keck Reps Meeting in evening. What: The overarching goal of this study is to improve our understanding of ice dynamics, glacial history and paleoproductivity of the Pliocene Weddell Sea using sediment cores from ODP Sites 693 and 695. Project Description: Today the Southern Ocean plays multiple critical roles in regulating earth’s climate and biogeochemical cycles. 1) Along the Polar Front Zone, Antarctic Intermediate Water (AIW) sinks, carrying CO2 and O2 to mid ocean depths. 2) South of the Polar Front, CO2 from the deep ocean upwells and directly exchanges2 with the atmosphere and provides nutrients to support a rich biological community. 3) Further south, in the Weddell Sea, the densest water in the entire ocean, Antarctic Bottom Water (AABW) sinks carrying CO2 and O2 to the deepest ocean. Thus the Southern Ocean, and in particular the Weddell Sea is a major source and sink for CO2 and therefore a potential regulator for Earth’s climate. We don’t know how similar the modern ocean is to the Pliocene ocean, but using sediments from ODP Expedition 113, we have an opportunity to discover more about Antarctica and the Weddell Sea during this critical climatic time. During the Pliocene, Earth’s climate began the transition from an obliquity to an eccentricity dominated climate system as shown in the most recently compiled benthic foraminifera record (Lisiecki and Raymo, 2004). In addition, paleoclimate estimates suggest that atmospheric CO2 levels were at 400 ppm, levels Earth’s atmosphere has just recently achieved. Deciphering Earth’s climatic history from geologic samples is fraught with problems. These include diagenisis, low sedimentation rates, sediment disturbance, missing intervals, etc. Nevertheless, it is worth persevering, as that is all that is available. Ocean sediment cores provide an excellent opportunity to identify paleoceanographic changes using sediment composition (size and mineralogy), microfossil assemblages, bioturbation and magnetic properties. In this project we will examine Pliocene sediments from two ODP sites on different sides of the Weddell Sea, Site 693 on the East Antarctic Continental Slope in the southeastern Weddell Sea and Site 695 roughly 400 km from the tip of the Antarctic Peninsula in the northwestern Weddell Sea (Fig. 1, Table 1). These two sites are moderately to well recovered (Fig.2); provide a thick Pliocene sedimentary sequence and high sedimentation rates. Sediments are dominantly silty and clayey muds with varying amounts of biosilica, primarily diatoms. Dropstones are common at both sites and Site 695 has more volcaniclastic sediments. Extensive research on these cores has been held back because of the problem of age determination. With the results of ANDRILL (Konfirst et al., 2011) and ODP Leg 318 (Tauxe et al., 2012), better chronostratigraphy is possible for these carbonate-free sediments. We have begun to use the new diatom biostratigraphy to narrow the possible sediment ages (Table 2) and will continue this effort. The diatom stratigraphy indicates very high sedimentation rates, >10cm/1000 years and puts the sediments that we focused on during the summer 2014 Keck project older than the Pliocene warm period (3.3 and 2.9 million years ago) that we anticipated. (Chandler et al., 1994; Fedorov et al., 2013). Diatoms ages at Site 693, between about 50 and 110 mbsf, an almost continuously recovered portion place it in the lower Pliocene with a very high sedimentation rate of > 10 cm/1000 years. This provides an opportunity to observe sedimentary changes on an obliquity scale. An obliquity signal has been identified from the ANDRILL 1B site in the Ross Sea (Konfirst et al., 2011), with higher productivity and more diatoms during warmer periods and more hemipelagic muds during cooler intervals. Another approach to determining orbital forcing and sedimentation rates is wavelet analysis (Darby et al., 2012; Sen et al., 2009). The orbital cycles identified at Site 693, using wavelet analysis on a variety of core measurements such as XRF, spectra and color (Hall et al., 2014) also show a strong obliquity-driven forcing. We are just beginning an analysis to identify the sedimentary changes that result from the forcing. One component appears to be a glauconite signal. Glauconite is found in the underlying Cretaceous sediments (OConnell, 1990). Cretaceous sediments were also recovered in dredge hauls of the canyon wall (Futterer et al., 1990). Futterer et. al (1990) speculate that the canyons were carved by glacial activity. Relative abundances of glauconite in combination with other sediment measurements (XRF, diatoms, grain size, etc.) will be used during the current academic year to attempt to define glacial interglacial cycles from Core 693A-8R. The results of this study will inform the specific projects proposed for 2015-2016 research. Possible student research projects for either Site 693 or Site 695. Changes in productivity. Higher productivity is associated with higher wt% biosilica, higher Ba/Al ratios (XRF) and higher diatom valve concentrations (Cook et al., 2013). If there was someone at a home institution to identify specific diatom species more subtle changes in biological communities might also be identified (Cortese and Gersonde, 2008). Most geochemistry labs can measure wt% biosilica (Mortlock and Froelich, 1989). Possibly C/N and N isotopes might also enhance understanding productivity signals and changes. The XRF data will be collected during the summer at IODP. Infaunal communities. Bioturbation varies throughout Site 693. High-resolution core images make it possible to identify different marine-floor sedimentary conditions using specific trace fossils or ichnofabric. These in turn might show glacial/interglacial or high and low productivity cyclicity. This would be done at the home institution using high-resolution core images. Paleomagnetic stratigraphy and provenance tracer. The magnetic reversal stratigraphy is poorly defined for Site 693 (e.g. Fig. 33, p 373 (Barker and Kennett, 1988)). Yet, based on the IODP 318 Expedition data, the current age calibrations of several diatom events in the Pliocene are “too young” to correlate with the Global Paleomagnetic Time Scale (Fig. 16 in (Tauxe et al., 2012)). The high sedimentation rate at this interval could help to improve the diatom chronostratigraphy. Rock magnetic properties themselves can also be used to trace provenance (Brachfeld et al., 2013; Tauxe et al., 2012). This project would require access to paleomagnetic facilities. Wavelet Analysis: can be done on the principal components of the XRF data, spectral data on the sediment, and possibly other measurements. The wavelets are used to identify frequency spectra within the analyzed material. By assigning an age to the frequency, a sedimentation rate is estimated. This can be used to look for orbitally forced and non-orbitally forced changes in the depositional environment. Provenance/mineralogy: can be addressed in multiple ways. Dropstones are common and predominantly ice rafted. Thin section and geochemical analyses of dropstones might allow a source region to be identified. This in turn can suggest iceberg travel paths (Williams et al., 2010). Icebergs are thought to flow for greater distances during colder climate intervals. Sand grains are common throughout the cores. The mineralogy of grains in grain mounts can be identified petrographycally and chemically. With access to an XRD, a student could determine the mineralogy of different sediment size fractions. Grain-size analysis: Grain size analysis can help to identify potential transport mechanisms of the sediment. In particular, we would like to see if there is a very fine fraction that might be wind blown. Prevailing westerly winds suggest that windblown sediment from South America is unlikely to reach Antarctica today or even during the last glacial (McCave et al., 2014). In particular at Site 695, is there a In samples with a fine fraction, that component could be separated and analyzed for chemistry and mineralogy to see if the source was similar to the sand-size fraction. Barker, P. F., and Kennett, J. P., 1988, Weddell Sea Paleoceanography – Preliminary-Results of Odp Leg-113: Palaeogeography Palaeoclimatology Palaeoecology, v. 67, no. 1-2, p. 75-102. Brachfeld, S., Pinzon, J., Darley, J., Sagnotti, L., Kuhn, G., Florindo, F., Wilson, G., Ohneiser, C., Monien, D., and Josephh, L., 2013, Iron oxide tracers of ice sheet extent and sediment provenance in the ANDRILL AND-1B drill core, Ross Sea, Antarctica: Global and Planetary Change, v. 110, p. 420-433. Chandler, M., Rind, D., and Thompson, R., 1994, Joint investigations of the middle Pliocene climate II: GISS GCM Northern Hemisphere results: Global and Planetary Change,, v. 9, no. 3, p. 197-219. Cook, C. P., van de Flierdt, T., Williams, T., Hemming, S. R., Iwai, M., Kobayashi, M., Jimenez-Espejo, F. J., Escutia, C., Gonzalez, J. J., Khim, B. K., McKay, R. M., Passchier, S., Bohaty, S. M., Riesselman, C. R., Tauxe, L., Sugisaki, S., Galindo, A. L., Patterson, M. O., Sangiorgi, F., Pierce, E. L., Brinkhuis, H., and Scientists, I. E., 2013, Dynamic behaviour of the East Antarctic ice sheet during Pliocene warmth (primary article): Nature Geoscience, v. 6, no. 9, p. 765-769. Cortese, G., and Gersonde, R., 2008, Plio/Pleistocene changes in the main biogenic silica carrier in the Southern Ocean, Atlantic Sector: MArine Geology, v. 252, p. 100-110.
: Nature Geoscience v. 5, no. 897-900. Fedorov, A. V., Brierley, C. M., Lawrence, K. T., Liu, Z., Dekens, P. S., and Ravelo, A. C., 2013, Patterns and mechanisms of early Pliocene warmth: Nature, v. 496, no. 7443, p. 43-+. Futterer, D. K., Kuhn, G., and Schenke, H. W., 1990, Wegener Canyon Bathymetry and Results From Rock Dredging Near ODP Sites 691-693, Eastern Weddell Sea, Antarctica, in Barker, P. R., Kennett, J. P., et al., , ed., Proceedings of the Ocean Drilling Program, Scientific Results, Volume 113: College Station, TX, TAMU, p. 39-48. Hall, J. T., True-Alcala, T., Gross, J., Castello, V., Stripe, C., Ortiz, J. D., and OConnell, S., 2014, Comparison of XRF and Spectral Reflectance Derived Cyclicity in Pliocene and Pleistocene Sediments From ODP Site 693, Dronning Maud Land, Antarctica: Geological Society of America Abstracts with Programs, v. 46, no. 6, p. 356.
: Marine Micropaleontology, v. 80, no. 3-4, p. 114-124. Lisiecki, L. E., and Raymo, M. E., 2004, A Pliocene-Pleistocene stack of 57 globally distributed benthic D18O records: Paleoceanography, v. 20, p. 1-17. McCave, I. N., Crowhurst, S. J., Kuhn, G., Hillenbrand, C.-D., and Meredith, M. P., 2014, Minimal change in Antarctic Circumpolar Current flow speed between the last glacial and Holocene: Nature Geoscience, v. 7, p. 113-116. Mortlock, R. A., and Froelich, P. N., 1989, A simple method for the rapid determination of biogenic opal in pelagic marine sediments: Deep-Sea Research Part A-Oceanographic Research Papers, v. 36, no. 9, p. 1415–1426. OConnell, S., 1990, Sedimentary Facies and Depositional Environment ot th eLower Cretaceous East Antarctic Margin: Sites 692 and 693. , in Barker, P. F., and Kennett, J. P., eds., Scientific Results of the Ocean Drilling Program, Volume 113: College Station, TX, TAMU, p. 71-86.
: Computers & Geosciences, v. Computers & Geosciences, no. 35, p. 1445-1450. Tauxe, L., C. E. Stickley, S. Sugisaki, P. K. Bijl, S. M. Bohaty, H. Brinkhuis, C. Escutia, J. A. Flores, A. J. P. Houben, M. Iwai, F. Jiménez-Espejo, R. McKay, S. Passchier, J. Pross, C. R. Riesselman, U. Röhl, F. Sangiorgi, K. Welsh, A. Klaus, A. Fehr, J., A. P. Bendle, R. Dunbar, J. Gonzàlez, T. Hayden, K. Katsuki, M. P. Olney, S. F. Pekar, P. K. Shrivastava, T. van de Flierdt, T. Williams, a., and Yamane25, M., 2012, Chronostratigraphic framework for the IODP Expedition 318 cores from the Wilkes Land Margin: Constraints for paleoceanographic reconstruction: PALEOCEANOGRAPHY, v. 27, p. 1-19. Williams, T., van de Flierdt, T., Hemming, S. R., Chung, E., Roy, M., and Goldstein , S. L., 2010, Evidence for iceberg armadas from East Antarctica in the Southern Ocean during the late Miocene and early Pliocene. : Earth and Planetary Science Letters, v. 290, p. 351-361. What: This project is motivated by the objective to better predict the bioaccessibility of trace metals in the environment. 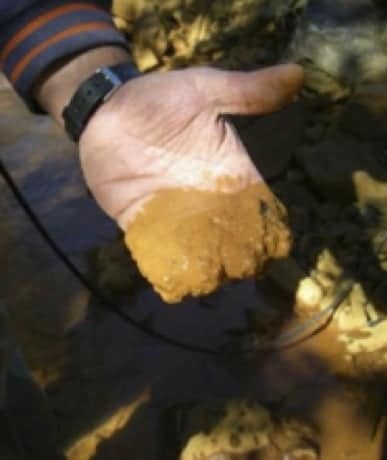 Students will collect samples of iron (oxyhydr)oxide precipitates and water from an abandoned mine site, synthesize pure and trace metal substituted Fe (oxyhydr)oxides, and conduct simple leach experiments with synthesized minerals. Students will also use thermodynamic modeling of lab and field leach solutions to elucidate aqueous interaction with the secondary minerals present. 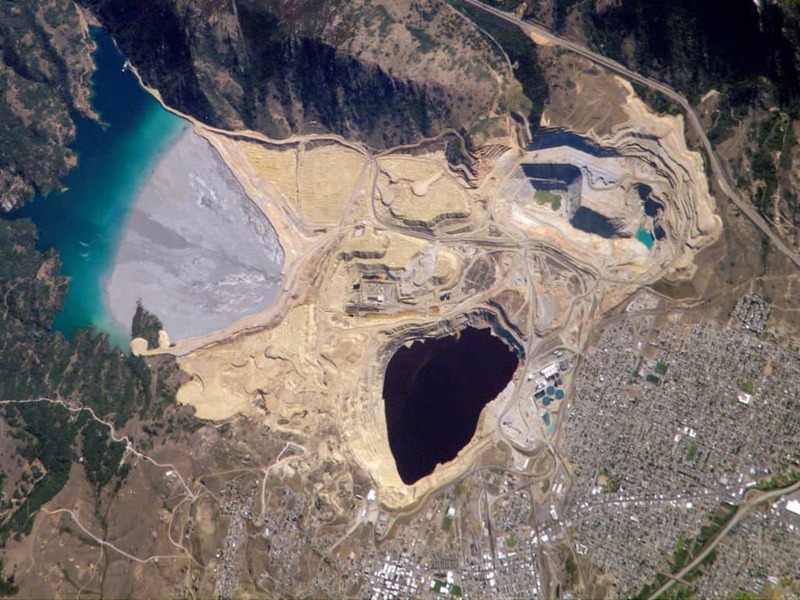 Project Overview and Goals: Trace metals (e.g., Mn, Co, Cu, Zn) are micronutrients for most organisms, but can be toxic above certain threshold concentrations. Trace metal bioaccessibility in aquatic environments is partly controlled by interaction with secondary minerals, and may involve both sorption-desorption and coprecipitation-dissolution reactions. During coprecipitation, trace metals may substitute into crystallographic sites, and may therefore be called trace metal substituted (TMS) secondary minerals. Many studies have focused on trace metal sorption-desorption, whereas relatively fewer studies have documented trace metal coprecipitation-dissolution. To elucidate how TMS secondary minerals control trace metal bioaccessibility, we will: (1) document trace metal substitution in and dissolution from synthesized schwertmannite (Swt), jarosite (Jr), and goethite (Gt); (2) compare and contrast the mineralogy, morphology, and chemical composition of natural ocherous precipitates to synthesized minerals; and (3) use thermodynamic modeling (PHREEQC) of lab and field leach solutions to elucidate aqueous interaction with the secondary minerals present. Geologic Background: The environments that are particularly prone to formation of TMS secondary minerals are those containing acidic, iron- and sulfate-rich solutions that result from weathering of sulfide minerals. The variety of secondary minerals that form in such environments is vast, but a majority of them contain O2- ± OH– or SO42- ± OH– as the major anion(s) and Fe2+ and/or Fe3+ as the major cation(s), with or without K+ or Na+. Partly because of their relative abundance in stream and river sediments and soils, classic examples include: schwertmannite [Swt; Fe8O8(SO4)2(OH)6], jarosite [Jr; (K+,Na+,H3O+)Fe3(SO4)2(OH)6], and goethite [Gt; α-FeO(OH)]. Trace metal(loid)s may substitute for Fe3+ in octahedral sites (Swt, Jr, Gt), for K+ in highly coordinated sites (CN ≥ 9; Jr), and for sulfur in tetrahedral sites (Swt, Jr). For example, when Cu2+ substitutes for Fe3+ in jarosite, charge balance is maintained by coupling this substitution with Pb2+ substitution for K+ (Hudson-Edwards et al., 2008). Likewise, phosphorus (P) or arsenic (As) may substitute for sulfur in jarosite (e.g., Burger et al., 2009; Desborough et al., 2010; Dutrizac and Chen, 2010). Interestingly, As substitution into synthetic jarosite increases dissolution rates in open systems and decreases dissolution rates in closed systems (Kendall et al., 2013). The potential for TMS in secondary Fe (oxy)hydroxide minerals will directly impact the bioaccessibility of a given metal(oid). Potential Student Projects: Students may synthesize pure and cobalt (Co)-substituted secondary minerals, and conduct parallel leach experiments with both types of synthetic samples. Synthesized solids will be characterized with X-ray diffraction (XRD) and scanning electron microscopy paired with energy dispersive spectroscopy (SEM-EDS). Solutions generated during simple leaching experiments will be analyzed for pH and conductivity, and solution chemistry will be measured using inductively coupled plasma mass spectrometry (ICP-MS). Each student may also collect Fe (oxyhyr)oxide precipitates and water samples from a field site near Cobalt, ID, and characterize these precipitates (XRD, SEM-EDS) and solutions (pH, conductivity, ICP-MS) upon return to Whitman. Students may then use the thermodynamic modeling program PHREEQC to analyze the solution chemistry results from their lab and field solutions. Students can also compare their leaching results to published leaching results for natural samples and/or their mineral. Thermodynamic modeling and comparing multiple leach studies can be done after the 4-week project at students’ respective home institutions. 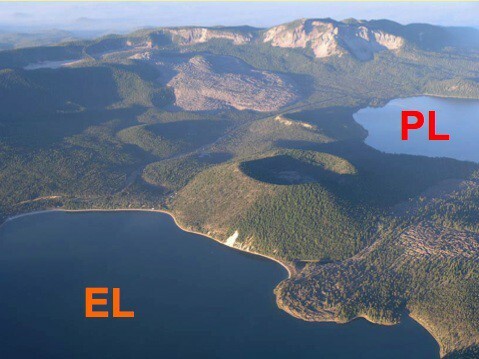 Paulina Lake (PL) and East lake (EL) in the Newberry caldera (OR). The large grey flow in the back is the Big Obsidian flow (~1300 BP), and the narrow isthmus shows a tuff ring and glassy lava flow entering EL (~6000 BP). What: The two Newberry Crater lakes are located at ~ 2 km elevation inside the Newberry Volcanic Monument area, which is located behind the Cascadian arc in the OR high desert, ~30 km south of Bend, OR. The lake waters are carbonate-rich, with neutral to slightly alkaline pH. Both lakes have subaqueous inputs of volcanic fluids: East Lake mainly H2S and CO2 with mercury as a pollutant, and Paulina Lake mainly carbonate-rich fluids with abundant Fe, As, Si and P. Both lakes have diatoms as important autotrophs, and the lake ecosystems are almost completely based on components from inside the earth: CO2, Si, and P are all of geothermal origin, whereas only the fixed nitrogen is generated inside the lakes by golfball-sized Nostoc cyanobacterial colonies using atmospheric nitrogen. Just add sunshine and there is your ecosystem! When & Where: June 24-July 22, 2015. Arrival in Portland OR on the afternoon of June 24th. Stay in Newberry from June 25 to July 8, then drive to a college or museum in OR (location to be determined) and stay there from July 9 to July 21. Return to Portland OR on the morning of July 22 for return flight home. If someone from a nearby school joins this project (e.g., Whitman College), you may want to drive to Newberry and have your own transportation available. We can discuss the details about expenses in person. Who: Professor Johan (Joop) C. Varekamp (Wesleyan University, E&ES, Middletown CT) is a geochemist by training and has worked on volcanic lakes around the world for several decades. He has worked on these two lakes for three years. He will guide the fieldwork, the coring efforts, the water sampling, the CO2 flux mapping, and the survey of the flood apron. 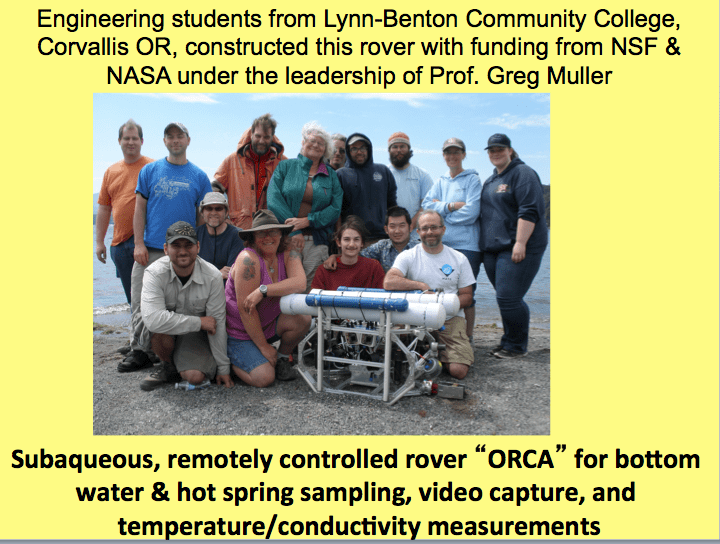 Dr Greg Mulder (Lynn Benton) may join us with his team of engineering students to work with the subaqueous rover. Scott Herman, Wesleyan University alumnus, with a Master of Science degree from UC Santa Barbara and an independent geothermal consultant based in OR, may be recruited and help with the field work, camping arrangements, and boating. In addition, other help from Wesleyan Universty may be recruited as needed. Project Overview & Goals: Our research goals are to understand the current functioning of these two lakes (water budgets, organic productivity, magnitude of volcanic inputs) and their history over the last few 1000 years. We will sample the lake waters in vertical profiles and scan the bottoms of the two lakes for gas vents and hot springs, using a fancy depth finder / side-looking sonar set-up as well as mapping with suspended CTD probes (lots of kayaking!). We will try to sample the gases and hot fluids with a subaqueous rover (in collaboration with Lynn Benton College, OR), which also has a drill, grabber, and video recording equipment. Elemental mass balance studies for the two lakes are the ultimate goals, using measured and calculated water and element fluxes, organic extraction of Si-C-P-N, and measurements of CO2 fluxes from the lake surfaces. We will collect cores of several m length to reconstruct the variations in volcanic gas input over time, apply tephrachronology to get ages, together with 210Pb-137Cs studies of the young sediments. After sampling and field data collection, waters and cores will be analyzed for their elemental and isotopic compositions, including d18O and dD in water, d13C in CO2 and in dissolved carbon, and d13C and d15N in organic matter. The cores will be analyzed for major and trace elements by XRF and ICP-MS. I can set up a diatom project for someone interested in diatom identification in the cores and water-filter samples. 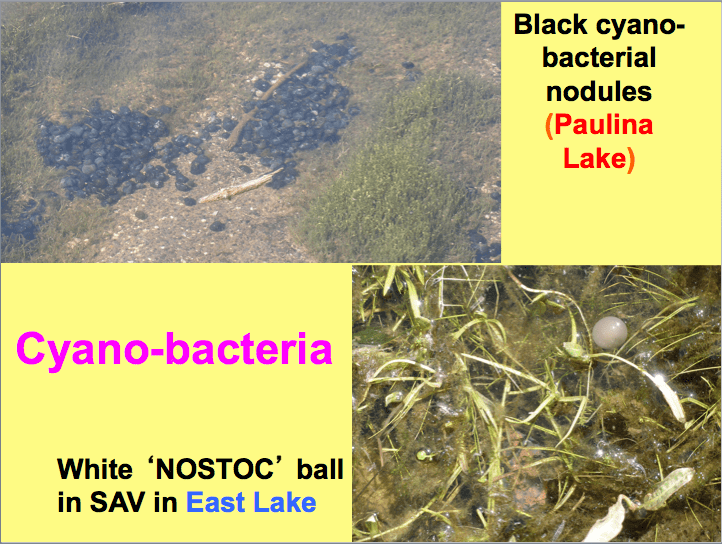 In Paulina Lake, we also find ostracods, which can be studied and analyzed for d18O for paleo-hydrology work. The volcanic inputs into these two lake systems and their variation over time. Sampling of lake waters and hot springs for water analyses (chemistry and stable isotopes); inferences can then be made on water residence times, mineral saturation, and toxic element dynamics. Sonar studies have shown bubble trains of gases that rise from the bottom of EL, but never reach the surface of the lake because they dissolve along the way. The lake ecosystems. We have labeled this subproject ‘Proterozoic Park’ because cyanobacteria were already known in the Precambrian, and life in these lakes may mimic that of the far terrestrial past. 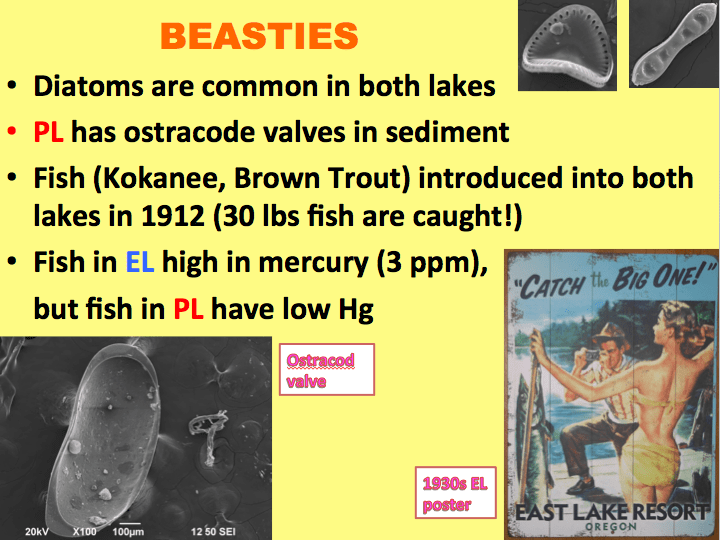 Questions include what has happened to the ecosystem since the first introduction of fish in both lakes around ~ 1912. The only fossils apart from diatom frustules and pollen in the sediment cores are valves of ostracods in PL, which waters are close to calcite saturation. The waters of EL have very large and several m thick floating islands of (largely) submerged aquatic vegetation, which also contribute to the organic carbon loading of the sediment (up to 8 % C(organic) in EL). The CO2 dynamics of East Lake. The CO2 input into EL leads to an interesting sequence of bubble input, dissolution and diffusion of CO2 upwards, with subsequent gaseous diffusional escape from the water surface into the air. Little or no atmospheric carbon invades the lake, and a flux of volcanic/geothermal CO2 leaves the lake. We will measure the flux of CO2 at the lake surface with a CO2 accumulation chamber with a LICOR CO2 detector. All needed equipment is available (float chamber, LICOR detector, gas pump, solar cells, ‘waterproof’ laptop) and on-site we will build a raft with all equipment, and take measurements at various locations on the two lakes. We may also use gold traps to collect and determine the Hg escape from East Lake. We will take small gas samples for the detection of methane and measurements of carbon isotope ratios in the escaping gases. The dynamics of bubble rise, expansion, and dissolution would make an interesting side project of a more theoretical and / or experimental nature. The Newberry lakes as a US Lake Nyos equivalent? The Newberry lakes have a strong thermal stratification in summer and a frozen surface in winter. Most CO2 escapes during the mixing events in fall and spring and through diffusion at the surface in the summer. The lakes may have been more poorly mixed during past times with a colder climate, and CO2 may then have built up in the hypolimnion. A perturbance or climate change may then create a turnover with associated lake explosion, as occurred at Lake Nyos (Cameroon) in 1976. The outlet of Paulina Lake (Paulina Creek) has many horsehoe-shaped water falls that are much too large to have formed with the modest water flow of the modern stream. Where the canyon enters the floodplain of the Little Deschutes River, a large apron of poorly sorted material is found with many boulders coated with white carbonates: a catastrophic flood deposit! 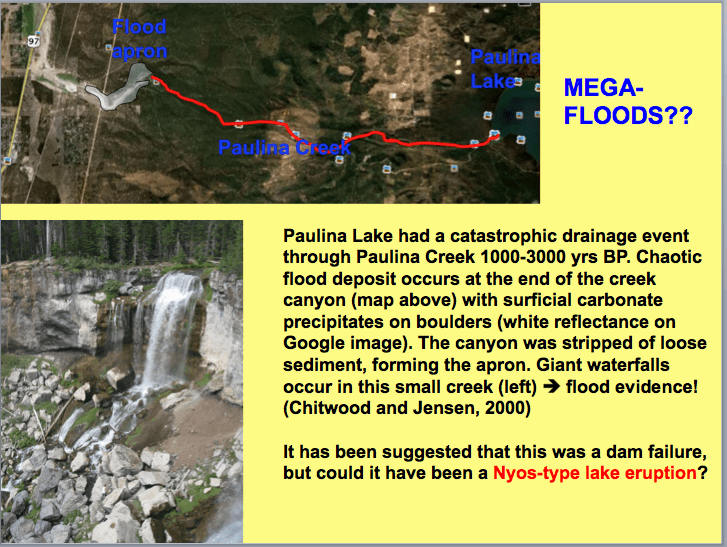 The common interpretation is dam failure with resulting floods, but we like to explore in how far a lake explosion (such as occurred at Lake Nyos) or a volcanic event may have created this megaflood. Sample subaqueous hot springs with rover or remotely with bottle. 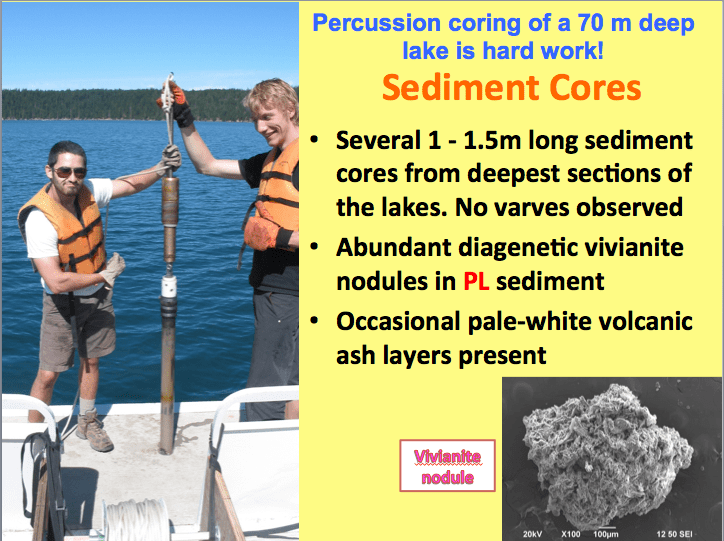 Explain the unusual core sediment chemistry through the volcanic inputs and describe processes responsible for fixing the Hg and As into the sediment. Possibly XRD work on minerals in the sediments (Vivianite has been found). V. Petrology of the ashes and cinders surrounding the lakes and one or two young cinder cones at the N end of the Volcanic Monument area (see Google earth map). This project will only go ahead if not enough students are recruited for the four projects listed above. This needs a petrology expert at the home institution to advise for a subsequent thesis study. Rock analyses by XRF and ICP-MS, petrography, and radiogenic isotope work. What is the nature of the Newberry volcano: extension of the Yellowstone plume/ Columbia River basalts or back-arc basalts related to the Cascades chain? The Newberry lakes have two commercial resorts and many Forest Service campgrounds. The nights are slightly cool (it is at 2 km elevation) and the days can be hot and sunny. Much time will be spent on the water, be it on the pontoon boats or in kayaks. You should be able to swim and have either boating experience or willingness to learn. These lakes are favorite fishing spots for tourists so there is a fair amount of boating and other folks around. Despite that, it is an area of pristine nature and grandeur as rarely seen, but only 2 hours by car from the major town of Bend, OR. There are small restaurants at East Lake and Paulina Resorts and we will alternate group cooking and outings to the resorts for dinner, or make a short expedition to the Lapine truck stop (nearest village) for food (EXCITING!). We will work with Park Research permits, but respect for nature and the environment is expected. If some or all of you want to spend some of your own money, you can rent a cabin for 4 people at about $150.-/night for four persons and we would supply the equivalent camping fees ($40.-/night for four) . The expected private costs per person then is $30.-/night for 14 nights. The second two weeks will be spent on a college campus and we will find housing there either in dorms or in simple hotel rooms. Cell phone coverage at the lakes is absent (20 minute drive to get coverage), but there is incidental WIFI available at the restaurants. Dangerous diseases do not occur here as far as I know; an occasional wildlife issue may occur, but this well-known outdoors tourist location is not in the middle of Tibet or something like that. The project expenses are high through the boat and van rentals and shipping of equipment, and I request a food contribution of each student of $500.- for the four week long expedition. The Keck budget will provide your RT air travel, camping fees and subsequent stays, all the food, and all research-related costs, with a remainder of a $1000.- stipend for each student (out of the $1500 Keck original or formal stipend). The work pace will be steady and by times hard: once you are on the lake in a boat we better finish what we were planning to do that day, but nothing extreme or endurance-related is expected. Many of the older fishermen/tourists are on the lake at 6 AM and get back by 5 PM! We will sometimes work as a group on a single project and sometimes work in subgroups. Ease of working with others and a sense of field camaraderie would be good character traits. Being able to camp for two weeks and staying clean (there are showers – take lots of quarters!) and well-fed would be helpful as well. And if you can cook, you sure are in business! Course Requirements: If you want to work on a geochemical topic, you must have taken a course in geochemistry and/or isotope geochemistry. The sediment chemistry studies also need geochemistry/isotope geochemistry and or mineralogy/petrology. The flood apron studies need someone with a geomorphic fascination (taken geomorphology and hydrology), whereas those opting for beasty studies (diatoms, ostracods) would need a (micro)paleontology or geobiology course. The petrology project needs a Min/Pet/Geochem type student. Everyone would profit from some insights into modeling through Excel or with a common computer code. We can discuss your options and recruit a local advising expert at your college. Petrology of the ashes and cinders surrounding the lakes and one or two young cinder cones at the N end of the Volcanic Monument area (see Google earth map). This project will only go ahead if not enough students are recruited for the four projects listed above. This needs a petrology expert at the home institution to advise for a subsequent thesis study. Rock analyses by XRF and ICP-MS, petrography, and radiogenic isotope work. What is the nature of the Newberry volcano: extension of the Yellowstone plume/ Columbia River basalts or back-arc basalts related to the Cascades chain? What: The 2015 southern New England Keck project will investigate Holocene and Anthropocene sediments and landforms to understand the regional history of floods, climate change and human impact. We will focus on targeted long-timescale (Holocene) sediment archives within major watersheds in the region (Housatonic, Connecticut, Thames) as well as detailed studies in small basins where multiple types of intense 17-early 20th land use and gully erosion has been identified. We will take advantage of the close proximity of focus areas and the home institution of the project leaders, allowing for a mix of field and laboratory research by student participants and active engagement with thriving research communities. Where: Southern New England (northwestern Connecticut and western Massachusetts). Students will be housed at UConn and we will make day and overnight trips to the field. Students will have access to laboratory facilities at UConn. Who: Six students. UConn Project leaders William Ouimet (geomorphology) and Michael Hren (geochemistry), and UConn graduate assistants. What is the record of Holocene floods in southern New England, providing a Holocene context for events such as Hurricane Irene in 2011? How do records of Holocene climate change vary across the region? Is there a record of frequent fire in northeastern forests over the Holocene? What is the erosional and depositional legacy of historic land use and sediment mobilization? How does landscape response to widespread deforestation in de-glaciated regions such as southern New England compare to well-studied examples in un-glaciated landscapes in the mid-Atlantic US? What is the role of slope and surface geology in affecting land use and degree of landscape response? What is the legacy of historic land use on soil morphology, carbon storage and geochemistry in now reforested terrain? Geologic Background: The processes that shape the southern New England landscape have shifted dramatically from Pleistocene glaciation to Holocene transgression to Anthropocene land management. The landscape of southern New England preserves a diverse record of Late Pleistocene to present environmental change. The Laurentide Ice Sheet retreated from the region between 21 and 17 ka, leaving a diverse array of glacial landforms and sediments throughout the landscape and leading to complex grain size variations throughout watersheds, river fragmentation (including wetlands), and varied bedrock/alluvial rivers (Thorson et al., 1998; Stone et al., 2005). More recently, the landscape experienced a remarkable history of land-use/land-cover change where nearly 200 years of deforestation and agricultural expansion in the 17th to early 20th centuries was followed by a dramatic reduction in agriculture and forest regrowth (Cronon, 1983; Merchant 1989; Foster et al., 2008) (Figure 1). In addition to landscape response associated with deglaciation and human impact, the southern New England landscape has also seen a range of climatic variability and extreme events such as hurricanes, floods and large-scale fires over the Holocene (e.g., Patton, 1988). 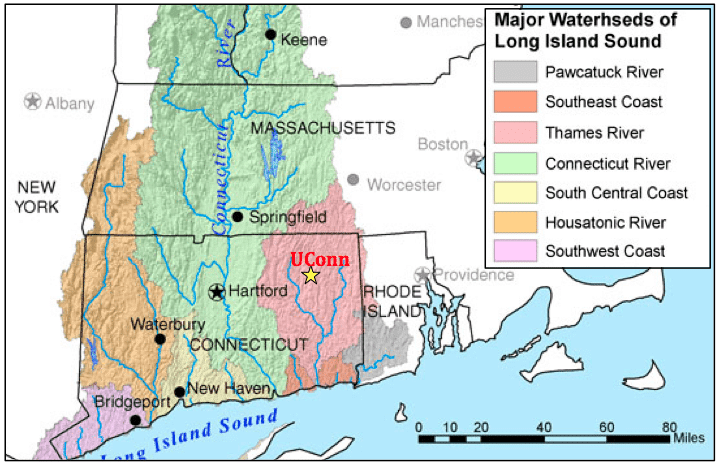 The 2015 southern New England Keck project will focus on select sediment archives within major watersheds in the region (Housatonic, Connecticut, Thames – Fig. 2) as well as detailed studies in small basins where multiple types of intense 17-early 20th land use and gully erosion has been identified (Figure 3). New geospatial data (LiDAR) has opened our eyes to a new level of detail for the geomorphology and dynamic history of this region. Available LiDAR datasets cover vast stretches of the forested terrain that now dominates the region and allow for a high resolution view of landforms and processes, fine scale targeting of field sites, and direct mapping of small scale features associated with the region’s 17th to early 20th century land use history (Johnson and Ouimet, 2014) (Figure 1 & 3). The 2015 southern New England Keck project will utilize LiDAR to target field sites for coring and trenching such as kettle ponds, wetlands and mill ponds, as well as identify watersheds characterized by varying types and extent of historic modification. Evaluating the record of sedimentation and environmental change within sediment traps along major waterways. LiDAR analysis reveals many potential sites for sediment coring and detailed geospatial analysis within the Housatonic, Connecticut and Thames River watersheds (Figure 4), including one where preliminary data indicates preservation of 4 major floods over the last 11,000 yrs. Projects focused on these cores will include obtaining and analyzing Holocene paleo-climate records (employing organic geochemistry) and reconstructing evidence for historic flooding (employing sedimentalogical analysis and DEM based flood modeling). Evaluating the record of sedimentation and environmental change within wetlands lying within low-gradient portions of the landscape and near topography displaying evidence for widespread historic land use. Projects would be focused on obtaining paleo-climate records as well as trying to identify and analyze legacy sediment hypothesized from 17th-early 20th century deforestation, erosion and sediment mobilization. We plan to target wetlands in the region allowing for a comparison with depositional records from steep portions of the landscape (i.e., eastern vs. northwest CT). Evaluating the record of sedimentation behind numerous historic mill-dams that have been identified through LiDAR and field work. Projects would be focused on identifying, characterizing and analyzing the sedimentological and geochemical signature of legacy sediment hypothesized from 17th-early 20th century deforestation, erosion and sediment mobilization. Evaluating widespread gully erosion observed throughout the region. Projects would be focused on addressing the hypothesis that gully erosion is dominantly Holocene or Anthropocene in origin. Field analysis and GIS based mapping of terraces and alluvial fans within historically impacted, but now reforested watersheds. Projects would be focused on identifying and analyzing these landforms and sediment deposition associated with 17th-early 20th century deforestation, erosion and sediment mobilization. Characterizing soil morphology and geochemistry for hillslope locations defined by different age, extent and types of historic land use. From historical imagery and LiDAR, we can specifically target hillslope locations characterized by different types and hypothesized periods of abandonment and land use. Evaluate whether there is a record of forest fire in northeastern forests over the Holocene. Projects would be focused on the measurement of PAHs in various sediment archives collected by the research group. Fire is hypothesized to have occurred in dry periods during the Holocene, as well as in association with Native American land use practices prior to European settlement. Figure 3: An aerial image shows a forested landscape while a hillshaded DEM derived from LiDAR data for the same area reveals polygons of stone wall lined fields, an old road, circular charcoal hearth platforms (lower right), an old foundation, and gully erosion. Data sources: CTECO (imagery) and USDA NRCS (LiDAR). Working Conditions: Fieldwork will include walking in forests and along streams in heavily wooded areas and coring in muddy environments and occasionally using small boats. All students are required to be proficient swimmers. Insect repellent is required as some ticks in the area carry Lyme Disease. Only faculty and UConn graduate students will drive the vehicles. Logistics: Keck 2015 project participants will be housed in dormitories and will eat breakfast and dinner at the University of Connecticut. We will make day trips to the field. Lunches will be provided on field days. There will be a longer trip in the beginning where we will camp and conduct fieldwork from a base camp. In addition, students will have access to laboratory facilities at UConn.